LOL I couldn't stop laughing reading this entry! BTW, I'm in the process of reading your blog from start to the most recent entry, and I really really enjoyed it. 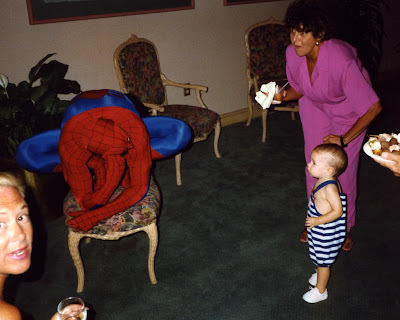 I've never met Spidey when I was a kid, and thanks to you now it feels like I did! 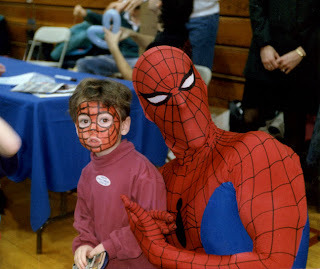 BTW, interesting description about the trompe-l'œil effect of your Spider-man costume. 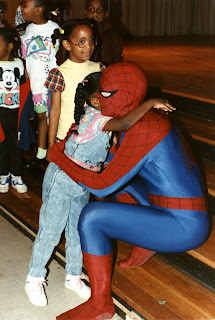 Two questions though - when you're in the costume, do you feel the need to emulate Peter Parker's characteristics or not? Also, officially, most of the world doesn't know that Parker is Spider-man - have you ever encountered a kid who says "I know who you are, you're Peter Parker!"? and if so, how did you respond to that? I actually answered your Peter Parker questions in a recent post entitled "Survival of the Fittest, Part II." I realize I probably hadn't when you commented and I apologize for the delay.